Miller spends too much time on "how to" instruction such as how to shop for clothing, how to buy or rent housing, and so on. While theres nothing wrong with giving students this information, its not economics, its personal finance. Millers book turns into a hodge-podge of personal finance and economic theory, in which the latter plays second fiddle. The books discussion of scarcity, resources, and cost is very good. The key concept of opportunity cost is brought out very well. So are private property, competition, and the profit motive. The books superficiality manifests itself early, however. For example, the differences between capitalism and command and control economic systems is correctly explained, but without much depth. Miller correctly observes that "all economies are planned in one way or another," but does not explore the inherent drawbacks of central planningthe problems of quality, indifference to consumer preferences, and especially the impossibility of rational allocation of resources in the absence of a price system. 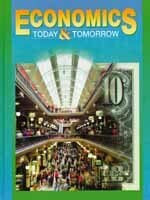 The book doesnt do nearly enough to help the student develop the "mental toolkit" of the economist. A more detailed critique is available.